Type your location data in the search string and click “Search”. 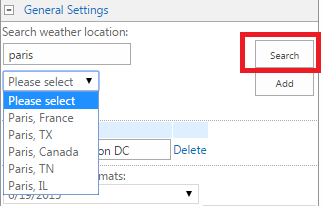 Once the list of available zones is uploaded, select the required zone from the list and click “Add”. You can add more than one zone. Added zone will appear. If you want to display the temperature for the selected location, check the required temperature scale (Celsius or Fahrenheit) or both of them. 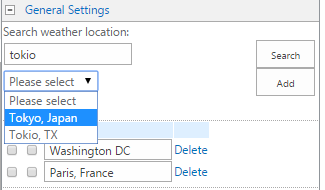 You can define special name for selected place, for example, define the name of office in the selected city.